It's 22:50 in Son Vida (Majorca), Spain right now. Golf Son Muntaner A splendid HD view from the Golf Son Muntaner. Son Vida (Majorca): Castillo Hotel Son Vida, 0 miles away. 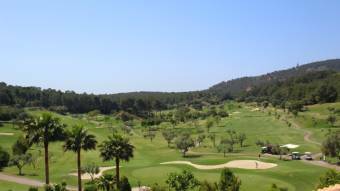 Son Vida (Majorca): Sheraton Mallorca Arabella Golf Hotel, 0 miles away. Palma de Mallorca: Palma de Mallorca Marina, 3.4 miles away. Palma de Mallorca: HD PTZ WebCam, 3.4 miles away. Palma de Mallorca: HD Stream Mallorca, Palma, Hotel Saragota, 3.4 miles away. Mein Schiff 1: Position and Webcam, 3.6 miles away. Portals Nous (Majorca): Livestream Puerto Portals, 4.1 miles away. Cala Fornells (Majorca): Port Fornells, 8.9 miles away.